Look, I find some of what Rent teaches suspect, because I’m used to relying on intellect (and intellect says that investing in junkies, strippers, squatters and ATM RobinHood-ers isn’t necessarily wise), but I try to open up to what I don’t know*. I’m a twenty-something goodie-two-shoes who has never once not been able to pay for a cup of tea. I, like most of Rent‘s pricey ticket-buying/soundtrack-owning audience, look a little out of place amongst the rock posters and trashcan fires of a Rent set. The one word that safely describes me in all of “La Vie Boheme” is ‘homosapien’. In fact, there’s a solid 15-25% of that song’s lyrics that soar straight over my head. But I can sing along to every single one of them anyway. Rent is simplistically written, more than mildly cheesy and does a lot to glamorize a lifestyle that is incredibly hard to pull off without dying and/or getting thrown in jail . There’s no stylistic or subject-based reason in the world for me, and millions of bright-eyed over-privileged girls just like me, to love Rent. But we do (even if our patronage somehow feels hypocritical- do we really have to eat tofu burgers just to get away with singing “La Vie Boheme”?!). There’s no reason for Rent’s timely story to have survived more than a few years past its 1994 debut. But there are currently two different productions of the musical playing in 2012’s post-gaymarriage, AIDS-surviving Toronto. People who don’t like Rent lampoon it for all the aforementioned whatevers. But those are the people who (like those who find Disney’s Pocahontas racially upsetting) are Completely, Massively missing the point of the actual story it’s telling. Rent isn’t a technically sophisticated piece of theatre, but it’s got more sincerity than almost anything else to ever hit Broadway and is almost impossible to get through without falling completely apart. There’s emotional sophistication to it that makes up for any pedestrian rhyme schemes or repetitive chord progressions or silly stories about golden-hearted strippers and their emo rocker boyfriends. Jonathan Larson wrote Rent when all around him his friends were dying of AIDS (the characters named in ‘Life Support’- Steve, Ali, Pam, Sue, Paul- that’s them) and based it on Puccini’s opera exploration of artistry and plague, La Boheme. He assembled an iconic original cast to embody his complicated and wrenching characters (future superstars among them) then passed away just as his creation was about to make history. And I mean “make history”. 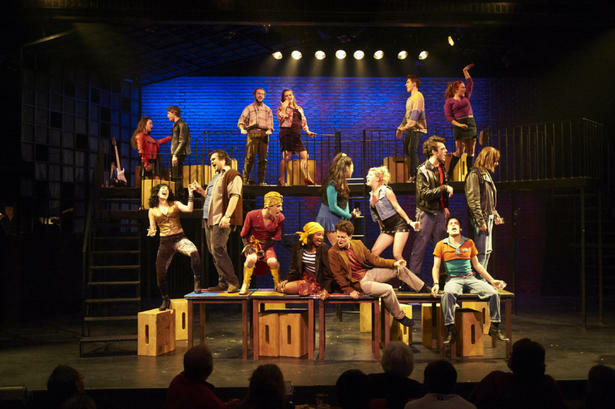 Rent ushered back in the rock musical genre and brought young people to the theatre who had honestly never been to one before. 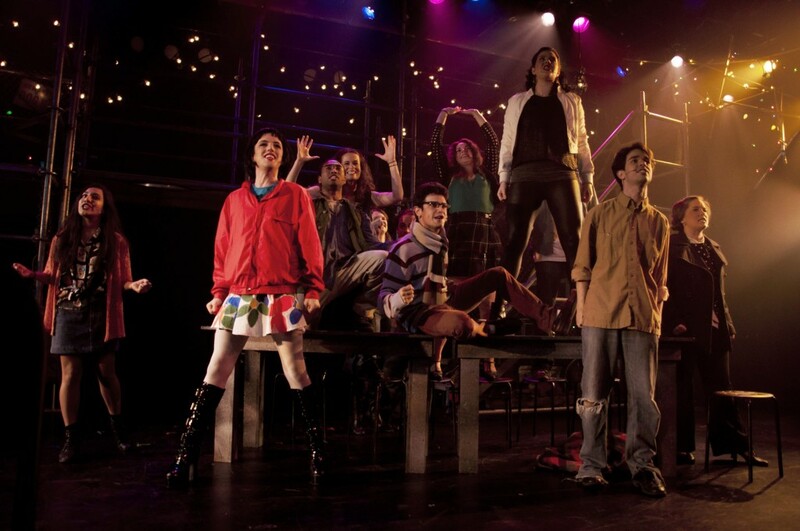 It raised awareness and ignited passion and was one of those shows where the actors got letters telling them that their performance saved the life of some depressed and lonely teenager in Iowa who was sure it wasn’t okay to be gay- until they saw Rent. There isn’t a single character in the show who isn’t in some way relatable and one can’t help but get wrapped up in their lives. Which is why I, clean-cut good-girl that I am, found myself in the theatre this week, falling in love with an emotionally crippled, tattooed, HIV-positive, former junkie/washed up rock star. On Saturday, I headed to the The Panasonic Theatre to take in the Rent presented by Sheridan College’s senior class (closing June 3). Sheridan’s Music Theatre Performance program is largely considered the best in the country- a fact that my every experience with its grads has substantiated- so going in, my expectations were sky-high. Compare that with my expectations for the same show presented in the much-smaller Lower Ossington Theatre (closing June 16). After the severely rocky experience that was their Legally Blonde, I wasn’t sold on the LOT Rent cast. But merely 4 days after Sheridan’s version, I braved the uncomfy LOT for my second Rent in one week. To my monumental surprise, the two productions are far more evenly matched than I’d assumed. Sheridan suffers under the hand of a soundboard operator who seems to have no idea who sings when, while The LOT needs to completely re-set the levels on their mics (ie: turn the volume down on the belters, up on Angel’s falsetto). Between the two productions, there’s one terrific Mark and one decent/typical/sometimesannoying Mark. There’s a knock-your-socks-off Maureen in one production and Joanne in the other. One show has a Collins who nails the character but not the vocals, the other has sensational vocals and less convincing character work. One has the aforementioned love-worthy Roger, the other has Roger as its most notable casting failure. Both sets have useful levels and both pits do Larson’s music decent justice (though the guitar had a weird lag on the title song the night I saw The LOT’s production). All in all, Sheridan showcases a handful of the talent I expected from them and The LOT showcases a lot more than expected, meaning that they’re both pretty good productions. 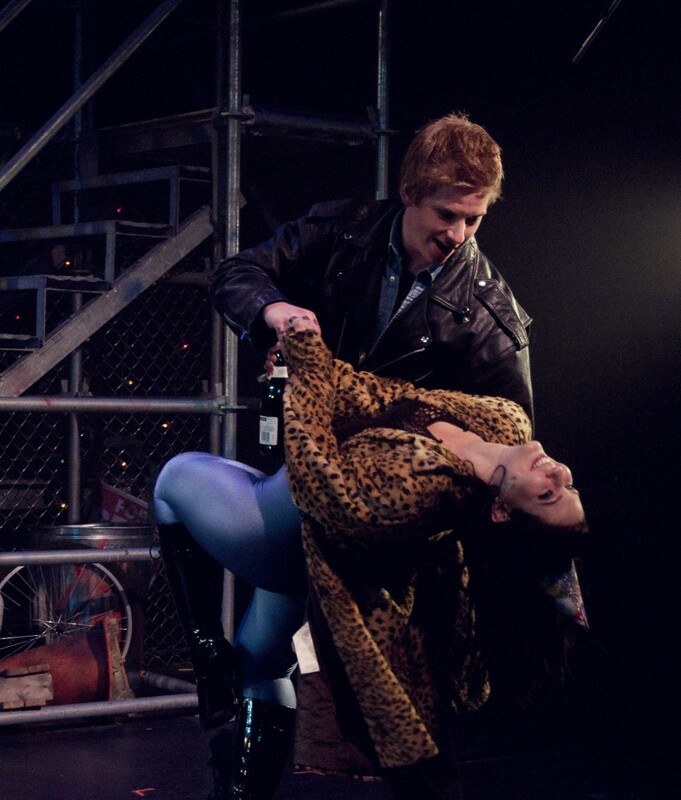 Rent‘s principal voice belongs to Mark and its principal story to Roger. The Sheridan Mark wins this particular head-to-head easily. Joel Gomez has, without question, the best voice I’ve ever heard on Mark (usually a speak-sung role) and makes the part his own rather than imitating Anthony Rapp’s original spazztastic performance. Gomez’s take is a bit Mark-via-Leonard Hofstadter, losing some of the character’s hipster artiness to his geekier side, but it really works. I’ve never heard a “Halloween” so beautiful, so Gomez gets an automatic A (and he carries his videocamera like a baby, a character detail so bizarrely poignant that I’m still mulling it over). The case of the Rogers is even more polarized. Sheridan’s Aaron Hastelow and The LOT’s Graham Fleming both seem too nice to play Roger- perhaps the darkest and most damaged of Larson’s dark and damaged characters- but Hastelow doesn’t manage to overcome that with either his voice (too nasal, not enough grit) or his acting. Also, whoever decided to put him in that horrendous wig deserves to be banned from the theatre. Fleming, on the other hand, battles his redhead and babyface into the ground until they make little to no difference. He’s not a super tortured Roger, at least not on the grand scale of Rogers, but I believed in his genuine affection for Mark, his unhelpfully magnetic chemistry with Mimi (unhelpful for the character’s sanity, totally helpful for the production) and, my god, That Voice. I’d seen Graham Fleming before- in The Laramie Project and Legally Blonde– and both times he’d stolen the production, but I had no idea he had a voice as soaringly awesome as he pulls out in “One Song Glory”. I’ve heard many a “One Song Glory” in my time and I don’t think I’ve ever liked it more. I’ve never really gotten the appeal of Roger- why a semi-sensible person like Mark would stand by him, why screwed-up-in-her-own-right Mimi would keep coming back to him- but if every Roger were Graham Fleming’s Roger, then I’d come back too. The characters I’ve always understood, no matter the production, however, are Collins and Angel. They’re the emotional core of the story, the lynchpins of the group and the victims of Rent‘s central tragedy via what I’m calling The Cordelia-Landingham Rule**. Angel is a part that requires the perfect harmony of utter fabulousness, true sincerity, and killer legs. As hard a combination as that seems like it would be to find, both Sheridan and The LOT cast the role well, if not perfectly. Collins, however, is a nearly impossible character to perfect. Literally no one I’ve ever seen, apart from the original cast’s Jesse L Martin, has managed to balance the thunderous/beautiful voice (which Sheridan’s Jacob MacInnis has, with vocal brilliance to spare) and tender/mature/genius character complexity (which The LOT’s Kevin Vidal manages nicely). If MacInnis and Vidal could morph into a single performer, Collins would, for once, be Martin-perfect. But they can’t, so this round goes to MacInnis because one phenomenal “I’ll Cover You (Reprise)” buys my love for a very long time (and his character work isn’t all that far off). Though Marissa Dingle is wonderfully more at home as The LOT’s brash Maureen than she was as classy meanie Vivienne in their Legally Blonde, she’s overshadowed by her powerhouse of a Joanne, Jacqueline Martin. With far and away the strongest female vocals in the cast and a superb sense of who her high-functioning, terrifically torn character is, Martin stands out like I didn’t know Joanne could. Her and Aaron Sax’s rendition of “Tango: Maureen” is an unexpected highlight (oodles funnier than Sheridan’s version of the number) and she and Dingle go toe-to-toe in an explosive “Take Me Or Leave Me” so big I wanted to scream at the sound guy to turn the damn mics off completely and let them go unplugged. Sheridan’s Joanne (Jaclyn Serre) is pretty good too, just not quite as exceptional. Her “We’re Okay” is excellent and I particularly loved her relationship with Gomez’s Mark, but just as Dingle is overpowered by her Joanne, Serre can’t quite keep up with her Maureen. It’s not that Serre’s a weak Joanne, Julia McLellan’s Maureen could overpower anyone. It’s rare that I look so forward to “Over the Moon”, but when McLellan entered just before intermission to deliver that wackadoo “performance art” piece, the Sheridan Rent tripled in energy. Sure, McLellan’s got an awesome voice- powerful and full of character- but what makes her Maureen great is that she’s nothing less than a spitfire. It takes a lot of presence to play the character who makes both Mark and Joanne “swoon when she walks in the door” and with whom “there will always be women in rubber flirting”; Maureen’s a magnetic crazy person and McLellan somehow manages to actually capture all that. Both Mimis are a mixed bag of great moments (the emotional “Without You” for Sheridan’s Michelle Bouey; a particularly well-acted almost-death scene for The LOT’s Jaclyn Herder) and weak vocals (neither actress really got behind the tough belter “Out Tonight” or the coy cat-and-mouse “Light My Candle”). Both have strong high belt registers that they pull out for (one of Rent‘s best songs) “Another Day”, but that strength is inconsistent and sometimes shows up at odd times. Herder has that amazing chemistry with Fleming’s Roger, though, so she comes out on top (because if Mimi can’t sell that, the whole story makes less sense). The LOT’s Antonio Olivito is decent as Benny but Sheridan’s Brett Schaller has the stronger voice and better “yuppie scum” bravura. He, like Serre, does a particularly good job of developing each individual relationship, even if it gets almost no stage time. I’m usually that weird person in the Rent audience who understands Benny more than you should (seriously, condos above your studio IS a good idea for basic bill-paying/functioning) but Schaller makes the humanization of the show’s “villain” easier by playing him rational instead of vindictive, with secret tenderness and real affection for Collins and Angel, at least. Both choruses are strong and energetic, though if pressed I’d give the advantage to The LOT because 1) they define their individual characters well and really get into it, 2) their sopranos don’t disappear entirely at points like the Sheridan ones. The chorus MVP, however, comes from the Sheridan cast: Mathieu Bellemare- a featured dancer in Marc Kimelman’s more complex dance numbers, a dedicated character actor and the beautiful “Will I” soloist. Bellemare commands the stage so effectively I couldn’t help but wish he played Roger (that character being the only really big letdown of the Sheridan production). The detail work in Lezlie Wade’s direction elevates Sheridan’s version and the cast as a whole makes a point of varying from the soundtrack character beats more than The LOT cast, but objectively, Sheridan has about the same success with the characters and story as The LOT does. I hadn’t been to a prodution of Rent in years when I saw the Sheridan version, so it hit me far harder than the LOT one did (see: sobs vs. misty eyes). That could have been the beauty in the details or the sweetness of Gomez’s voice or the poignancy of “I’ll Cover You (Reprise)”. But if that were the case then surely Fleming’s “One Song Glory” or Jaclyn Herder’s performance in “Finale B” would have had the same effect. After two productions in a single week, I think it’s safe to say that the magic may be in nothing more or less than the simple joy of hearing Rent again. *If you do not understand this reference. Click HERE and fix your life. ** King Lear–West Wing references. Look it up.